Good first day, some minor bike problems. Extremely windy bridge! Made it through day one! Found rai at train station. Time for lunch! Made it up through the delta and met rai at the train station right on time. ate lunch at the foot of the capital, where jeff raided our state orange tree. Had a great – though hot ride up the american river bike path to folsom. Lots of cyclists. Dined on spaghetti-os and beer. Quote of the day – there. It’s really hot and hazy. Will be really happy when we get outta this town. Bit of a rough start this morning. Cyclists beware! Don’t try to ride from Folsom to lincoln. You’ll find yourself in some endless purgatory of labrynthian sub-developments and sprawling strip malls, where people don’t know how to go 5 miles without a freeway. Once we escaped that mess, we got on much nicer quiet back roads. We also found the cheapest shakes since 1985 in wheatland. 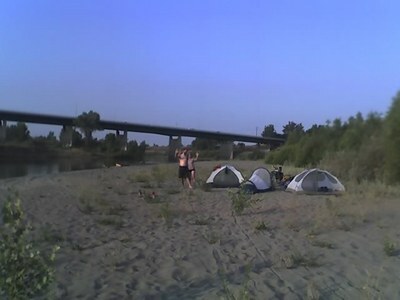 Now we’re camping on a beach on the feather river. This is pretty great! Should hit chico tomorrow and we’ll find out if lassen is too smokey for us to climb. 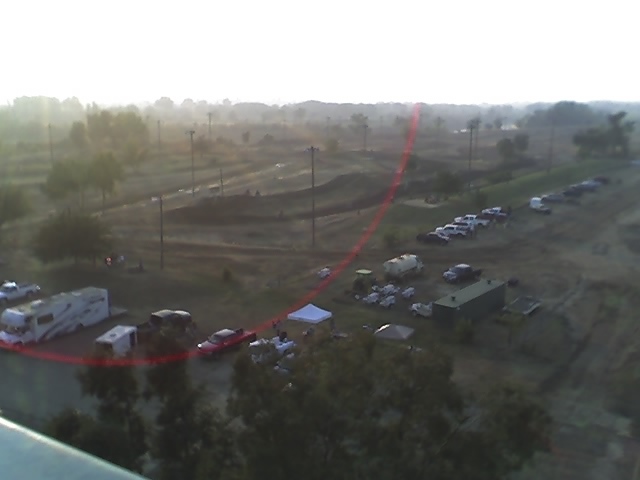 View of massive motocross park from bridge.